Kyle Shanahan has been the Redskins offensive coordinator since 2010. The Christmas dinner table at the Shanahan household just got a whole lot more tense. 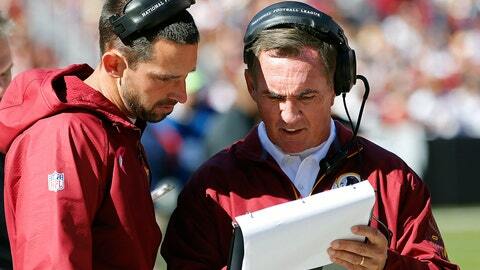 Amidst a lousy season, Redskins offensive coordinator Kyle Shanahan has decided to end working with his father Mike Shanahan after the 2013 season, according to an NFL Media report. Kyle, who has held the offensive play-calling duties in D.C. since 2010, wants to shake the "stigma" that is attached with working with his father. It first was apparent that the two had conflicting ideas when the decision to bench quarterback Robert Griffin III for the season became official last week. Naturally, Kyle told reporters that he had "zero involvement" in the decision. The drama in D.C. continues to spill over after a report surfaced that a fracture emerged between Shanahan and owner Dan Snyder.